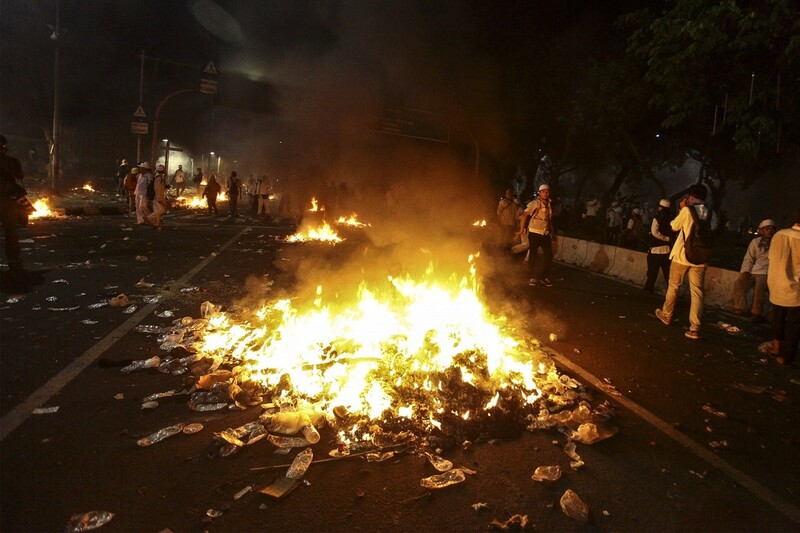 Tensions in Jakarta are gradually easing after a rally by thousands of people turned violent on Friday. In front of the House of Representatives in Senayan, a crowd that had attempted to forcefully enter the compound began to disperse at 4 a.m. on Saturday. They agreed to leave the area after leaders of the protesters had met with People's Consultative Assembly (MPR) Speaker and National Mandate Party chairman Zulkifli Hasan and a number of lawmakers, including Sufmi Dasco Ahmad of the Gerindra Party and Abu Bakar Al-Habsy of the Prosperous Justice Party (PKS). “Like the government has promised, the [police] will immediately process the case regarding the [alleged] insulting of the Quran by Ahok,” Zulkifli told the crowd, referring to gubernatorial candidate and incumbent Jakarta Governor Basuki “Ahok” Thahaja Purnama, as quoted by kompas.com. Around 100,000 people from various Muslim organizations swarmed Jakarta streets to demand the criminal prosecution of Ahok for alleged blasphemy. Ahok, a Christian and Indonesian of Chinese descent in the Muslim-majority country, sparked uproar among Islamic groups with a comment on verses in the Quran during his visit to Thousand Islands regency in late September. The police have received around a dozen reports regarding the case. The rally was peaceful until Friday evening, when some protesters refused to disperse although the time for rally had ended. The police had given a permit to stage the protest until 6 p.m. Some protesters started throwing stones and bottles at police officers after the deadline and tried to break through the police barricade to enter the State Palace. Police used tear gas after several protesters set off firecrackers and ignored calls to leave the area. Meanwhile, police also prevented protesters from other areas from heading toward the State Palace. Nearing 9 p.m., police and military with 1,500 personnel in total began to tighten security at the House to anticipate the mass exodus. The mass began to arrive at approximately 10 p.m., but no one could get into or out of the building for security reasons. At the eleventh hour, protesters occupied the road in front of the building. They insisted to stay the night at the building, even though there was no official statement from the House since it is in recess.